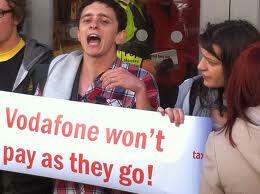 Background: VODAPHONE – Taxman let Vodafone off £6bn bill. Private Eye investigation: Vodafone – don’t pay as you go and Vodafone-a-friend at HMRC . ARCADIA GROUP including TOPSHOP, DOROTHY PERKINS & MISS SELFRIDGE: Philip Green to be target of corporate tax avoidance protest and Topshop chief Sir Philip Green to conduct review of coalition spending cuts. Avoiding tax is big business. 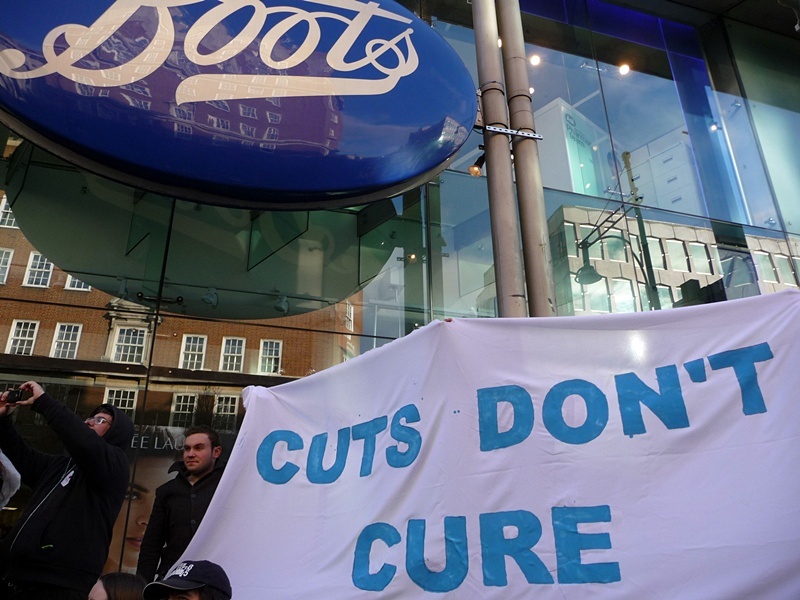 British corporations avoid up to £25 billion a year in tax, with major offenders including Vodafone (owes £6 billion); Boots (paid £0 in tax last year); and Top Shop, where boss Philip Green has signed ownership of his company over to his wife in the tax haven of Monte Carlo. He now pays no tax in Britain . Tax-avoiding corporations cost the government billions each year, money that could be used to invest in services and protect jobs. Instead, HMRC are writing off tax bills for the richest in our society, whilst sending bills to pensioners, workers and others who they claim owe thousands due to their miscalculations. Notts Save Our Services will be joining a national day of action against tax-avoiding corporations, starting from Vodafone in Clumber Street and visiting other tax-avoiders along the way. Tell the corporations: it’s time to pay tax! 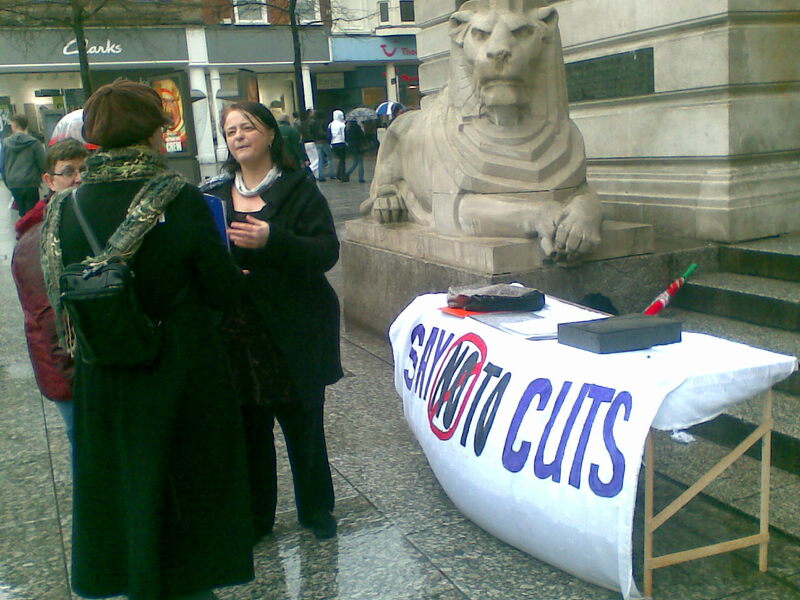 On Clumber Street in Nottingham city centre today a demonstration was held outside the Vodafone shop about their non-payment of tax in Britain and in other countries. Why are services and jobs being cut when this could be covered by getting corporations and the rich to pay up? Noone was available to answer this question as the shop had been closed before the demonstration got there, and a small police cordon was there too (to protect business, as usual?). 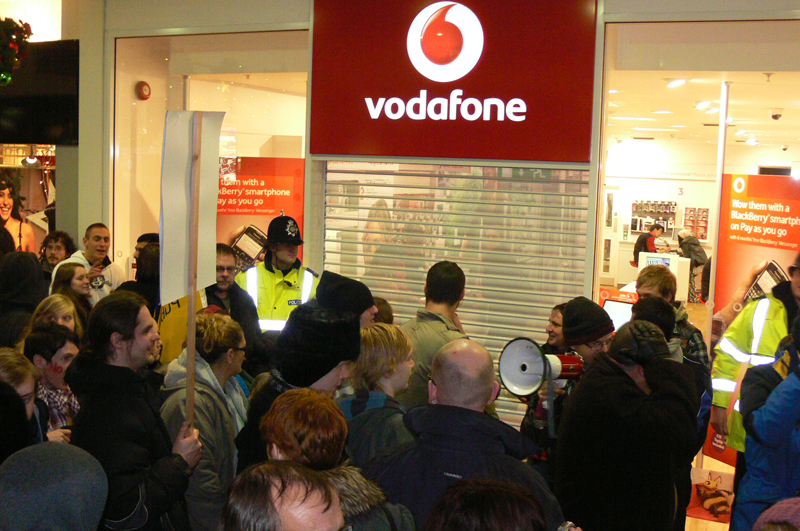 The Nott SOS demonstration clearly stated it was not directed at Vodafone shopworkers or shoppers but at the directors, owners. This message was not lost on passers-by. As well from those on holding placards in front of the shop, down the whole of Clumber Street the cry of “Vodafone pay your taxes” could clearly be heard. View [Photos] on Notts Indymedia.